Win Raffle Prizes! Now through Christmas!! Tour Waynedale, Vote For Your Favorite Decorations & Win! Your Vote Enters You To WIN Any Of The Raffle Items! Cut out the entry form out of The Waynedale News and submit your vote at any of the participating locations! (only one entry form submission per household, must enter by 12/25/2015) Note: We will contact you if you’ve won a raffle prize! 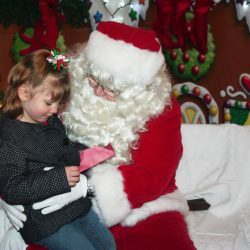 Bring your camera for a Meet & Greet with Santa! Then take a tour through the decorated corridors of the business district and neighborhoods of Waynedale on the Holiday Trolley. Open your eyes! Believe it or not! We are surrounded by holiday happenings wherever you look. Music and lights in stores and homes remind us of such joyous occasions.